This Twin/Twin Bunk Bed is 100% Solid Wood. Wardrobe and Nightstand Can Be Sold Separately. You Can Also Choose to have 2 Drawers or a Twin Trundle underneath the Bed. Bed Size: 61 In. (H). x 83 In. (L). x 44 In. (W). Wardrobe Size: 72 In. (H). x 39-3/4 In. (L). x 20-7/8 In. (W). Nightstand Size: 20-1/4 In. (H). 18-1/8 In. (L). x 16-1/8 In. (W). The Drawers Underneath the Bed Size: (Each Drawer) 36-5/8 In. (L). x 18-1/2 In. (W). x 9-1/2 In. (H). Trundle Size: 74 In. (L). x 40-1/2 In. (W). x 6 In. (H). 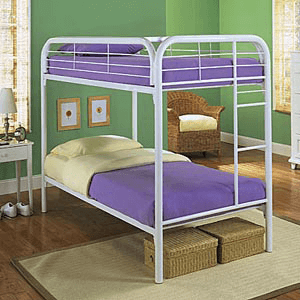 • Twin/twin • Cappuccino or White finish • Convertible design • The under seat cushion included • Safety rails,Ladder • Great strength and durability • Versatile Twin Convertible Loft Bed with Cushion • Some assembly may be required. This Solid Pine Bunk Bed. 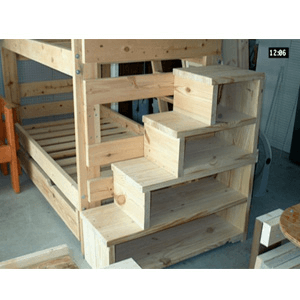 This Solid Pine Bunk bed features: • Traditional style. •Bed includes 2 under bed drawers. •Safety and sturdy metal to metal joints. 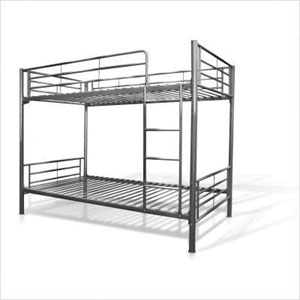 • Includes 2 H/boards, 2 F/boards, 2 Slat Rolls for Mattress support, 2 Guard Rails, 4 Rails, Ladder. • Easy to convert into two separate twin size beds. Dimensions: 80x43-1/3x69H. Twin Convertible Bunk Bed in Oil Stain Oak Finish. Size: 80L x 42W x 63H. Mattress Sold Separately. 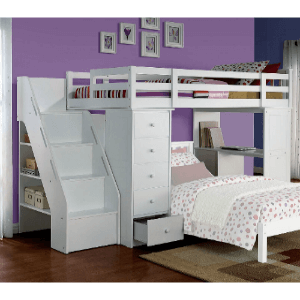 Casual Style Twin Bunk Bed In Cherry Finish. 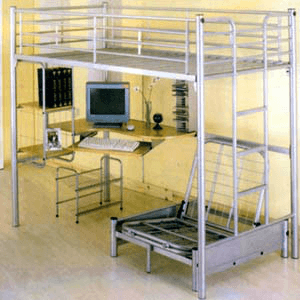 Features A Front Ladder That Extends From The Top Bunk To The Floor And Two Underbed Drawers. This Twin/Twin Bunk Bed is 100% Solid Wood. Chest and Nightstand Can Be Sold Seprately. You Can Also Choose to have 2 Drawers or a Twin Trundle underneath the Bed. The Post is 2.5 In. The Clearence is 26-3/8 In. Bed Size:61 In. (H). x 80 In. (L). x 42 In. (W). Chest Size: 52-1/2 In. (H). X 31-5/8 (L). x 17 In. (W). Nightstand Size: 20-1/4 In. (H). 18-1/8 In. (L). x 16-1/8 In. (W). The Drawers Underneath the Bed Size: (Each Drawer) 36-5/8 In. (L). x 18-1/2 In. (W). x 9-1/2 In. (H). Trundle Size: 74 In. (L). x 40-1/2 In. (W). x 6 In. (H). Wooden Bunk Bed With Bookcase. 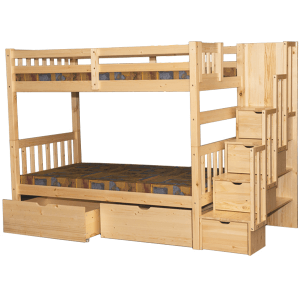 Twin/Twin Convertible Wooden Bunk Bed In Natural Finish. Dimensions: 81 x 43 x 55H.. Easy To Assemble. 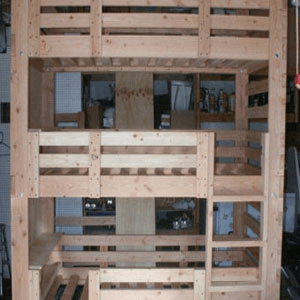 Convertible Wooden Bunk Bed With Drawers In Oak Finish. Beautiful Design. Easy To Assemble. Dimensions: 81 x 43 x 65H.. 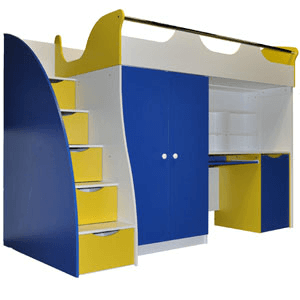 Create a fun room design for your child with this comfortable 2x6 bunk bed. This bed features two twin size beds, and is perfect for two children sharing a room, or for a child who loves to have sleepovers. 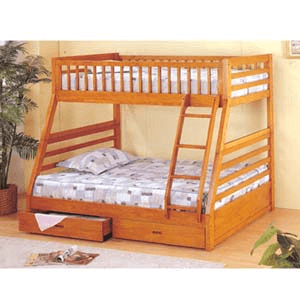 The bed simple wooden frame design, and would match a boy or girls style. 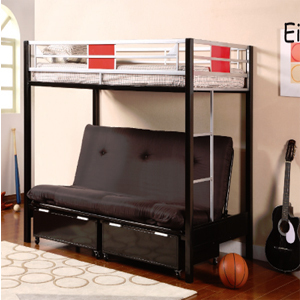 With a built-in ladder and sturdy side rails, this bunk bed will be a safe, functional bed for your childÃs room! Made of 2x6 posts and safety rails. Item & Dimensions • Width (side to side) 42 In. W • Height (bottom to top) 56 In. H • Depth (front to back) 81 In. D • Weight 126.5 lbs • Bunkie Board or Slats are not included • Wood & Finish The finish is protected with a three-stage lacquer finish for durability. • Finish & Paint Options Honey pine stain. • Style Traditional • Mattress Options - Sold Separately 2 Twin Bunk • Mattresses - max 9 inch thick Bunk Bed Construction All bunk beds independently tested to conform to Federal Safety Standards: ASTM F-127-07 Standard Consumer Safety Specifications for Bunk Beds, Code of Federal Regulations (CFR) 1213 for Entrapment Hazards, CFR 1513 Requirements for Bunk Beds. Case Construction Matching case pieces are available with side roller guides for smooth action and are uniquely designed for storage. Quantity Discount Available. 4 Post Panel Twin/Twin Bunk Bed 67 High in American Oak. Strong Construction. Easy To Assemble. 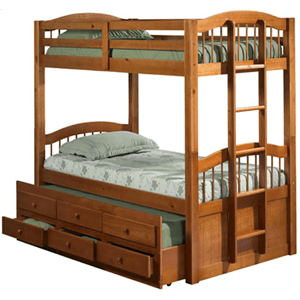 Wooden Convertable Twin/Twin Bunk Bed. Available in White and Oak Finish. Chest is also available in white and oak finish. Easy to assemble.